Beverly Ellen O'Brien obituary. Carnes Funeral Home. Beverly Ellen (Crody) O’Brien passed away on Aug. 21, 2018 surrounded by family. She was born on Nov. 28, 1951 to Guy & Wilma Crody in East Chicago, Indiana. She was raised in Griffith, Indiana where she graduated high school. She has been a resident of Santa Fe for 41 years. 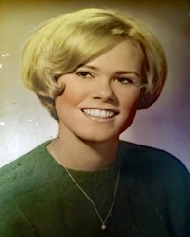 She is survived by her husband Kevin O’Brien whom she married in the summer of 1971, sons Kenneth O’Brien and wife Cindy, Jason O’Brien and wife Molly, grandchildren Jase, Kayley, Chloe and Layson, brothers David Crody and wife Debra, Kevin Crody and wife Adriana, Uncle Tilman Crody and wife Marian, cousin Gary Crody and wife Loretta, cousin Donna Thornell and husband Phillip, and numerous other relatives, friends and her beloved poodle Abby. She is preceded in death by her parents, brother Kenneth Crody and her precious dog Spoodles. Beverly was the kindest person you’d ever meet. She loved spending time with her grandchildren, visiting casinos, family get-togethers and random road trips. She was an avid collector of porcelain dolls, Barbie dolls, owls and Moon & Stars glassware. She was a selfless person who helped many people and leaves a legacy behind as a caring, strong woman. She will be dearly missed by all. Services will be held on Wednesday, Aug. 29, 2018 at Carnes Funeral Home, 3100 Gulf Freeway, Texas City, Texas 77591. Visitation is from 5-7 PM with services to follow at 7 PM. A special thanks to Dr. Weston, PA Jill in Fast Track, PA Abey Mathnl and the staff at MD Anderson Cancer Center in Houston for their special care. In lieu of flowers, please send donations to MD Anderson.